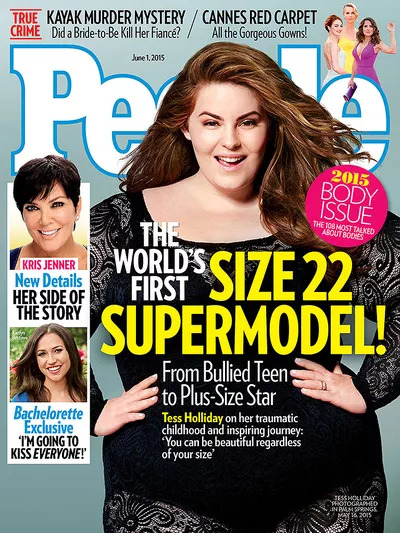 When model Tess Holliday saw herself on the cover of People, she burst into tears: “This was definitely a wildest dreams moment for me,” the 29-year-old said on the Today show yesterday. "It's kind of like winning the lottery." In the magazine’s 2015 Body Issue, which hits newsstands today, Holliday talks about how she became the first size-22 woman to get signed by a prominent modeling agency, earlier this year. But none of that deterred Holliday from chasing her dream. She attended her first open casting call at age 15, and after years of rejection and perseverance, she recently landed major campaigns with Benefit Cosmetics and plus-size brand Torrid. With more than 747,000 followers on Instagram, the heavily tattooed stunner is now leading a viral movement to help others feel confident in their skin. She created the hashtag #effyourbeautystandards to encourage women to embrace their bodies, no matter the size or shape. “It’s all about accepting yourself the way you are,” Holliday explained on the Today show. “If you want to work towards a better you in whatever regards… do it. But you’re okay just the way you are today." Holliday’s message is spot on. There's no doubt that the first step toward living a healthier lifestyle is self-acceptance. "Health is so personal," she told Today, when asked about people who worry about her size and the message this milestone sends. She knows from experience that criticism doesn’t motivate a person to lose weight. “When people are telling you, ‘You’re fat and gross,’ it does the complete opposite,” she told People. To take good care of your body, you need to love and appreciate it. (In fact, research shows that feeling 'fat-shamed' may only lead to more weight gain.) Positive lifestyle changes are more likely to last when you believe you deserve them. Case in point: Body-proud Holliday works out with her personal trainer at least four days a week. This Instagram shot from last week shows her getting her sweat on.